This is one of those instances where I summoned up my courage to knock on the door of a complete stranger and ask to take pictures of their garden. Judging from the homeowner's easy acceptance, I had the feeling I wasn't the first person to make such a request. 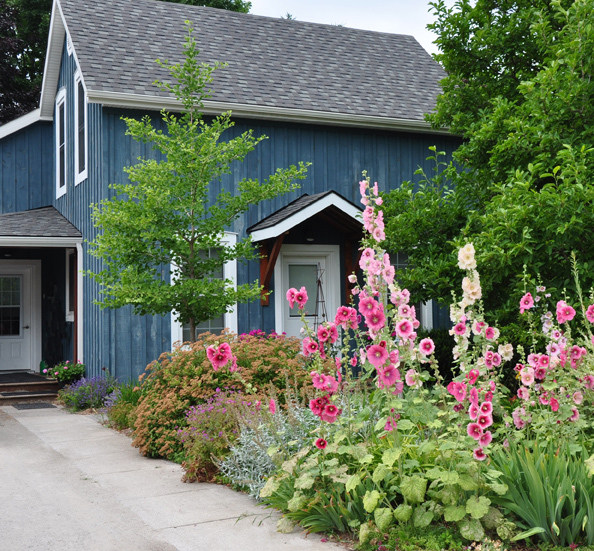 Located in a little town that is a popular tourist destination, the house with its eye-catching display of hollyhocks demands to have its picture taken. 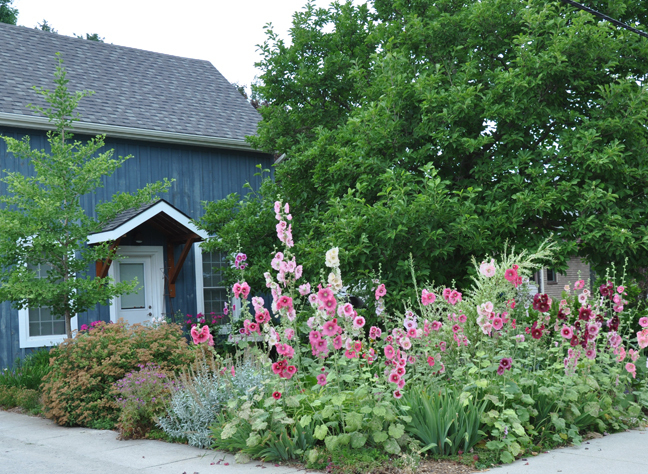 If the homeowner had devoted the entire front garden to the tall hollyhocks, it could have had the potential to look a bit wild and unkempt. 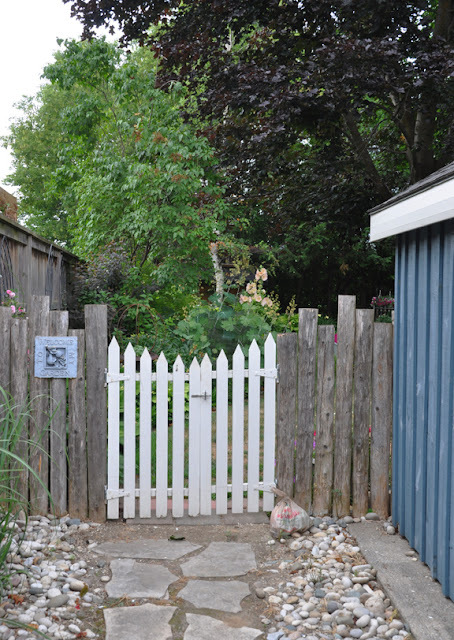 Instead, she wisely chose to open up and simplify the centre of the front yard. 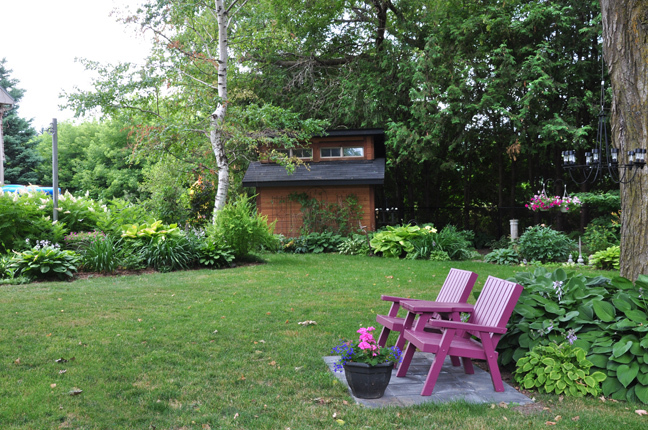 To create an informal courtyard she laid down a thick layer of mulch. 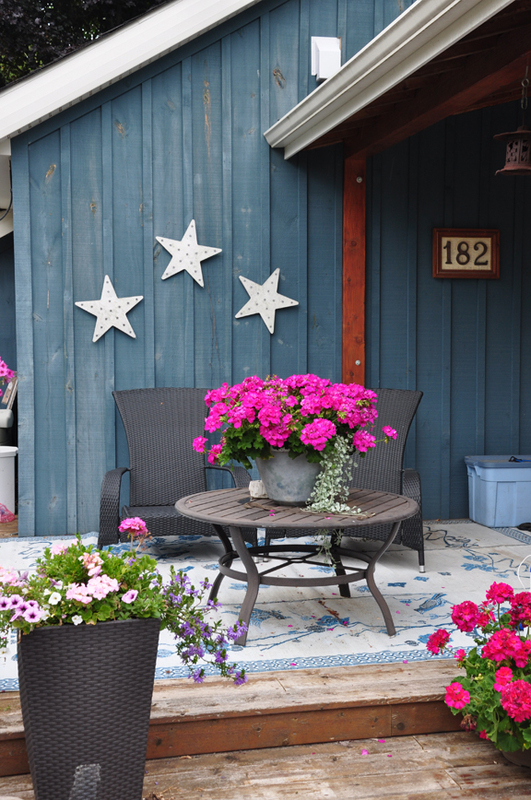 A decorative birdbath in the middle gives the area a pretty focal point. 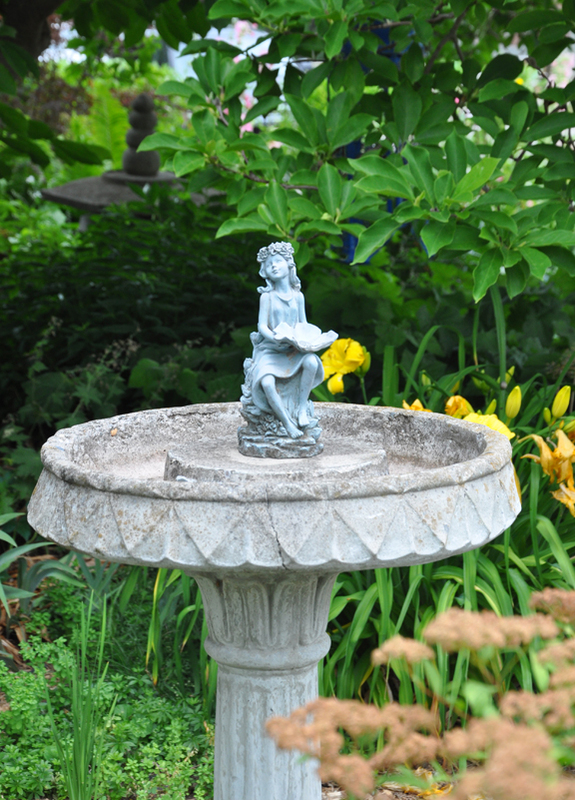 A birdbath makes a lovely focal point. A soft peach rose adds a romantic touch to the area beside the birdbath. 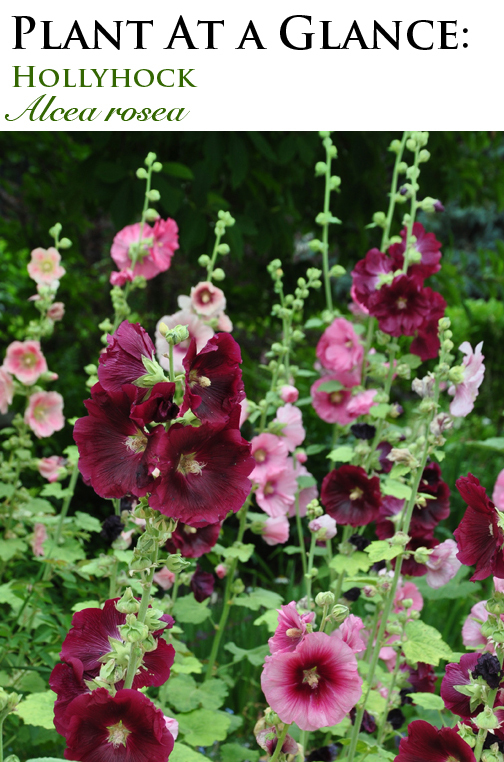 Hollyhocks are actually a short-lived perennial, but they act as a biennial. They grow leaves the first year and flower in the second. 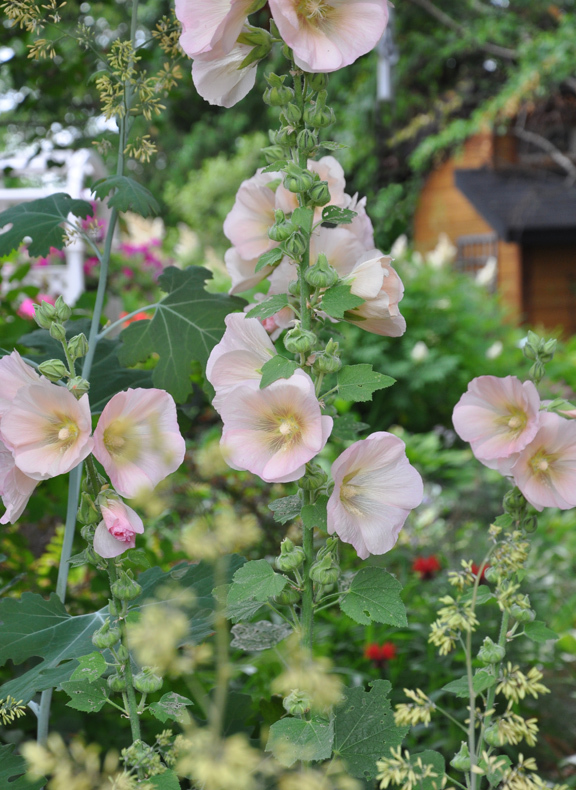 On average hollyhocks live for two years, but if you deadhead the flowers, the plant may store enough energy to last as long as three years. Cutting them back to the ground in the fall and mulching around the crown may also help extend their life. 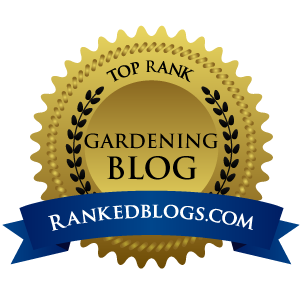 Some varieties grow 2'-3', while others can reach a height of as much as 6'. 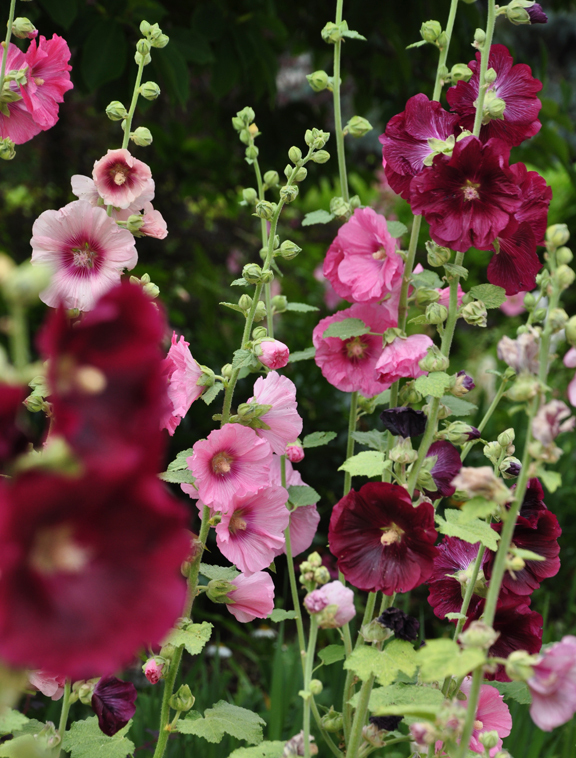 Hollyhocks come in an array of colors that include white, pink, yellow, red, maroon and black. As well as the classic single blooms, the flowers come in many petaled forms. 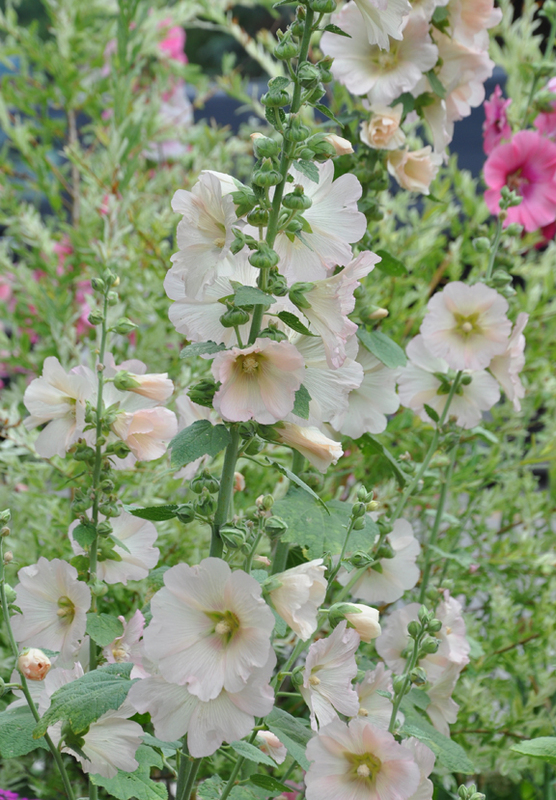 Hollyhocks need full sun and moist, rich well-drained soil. 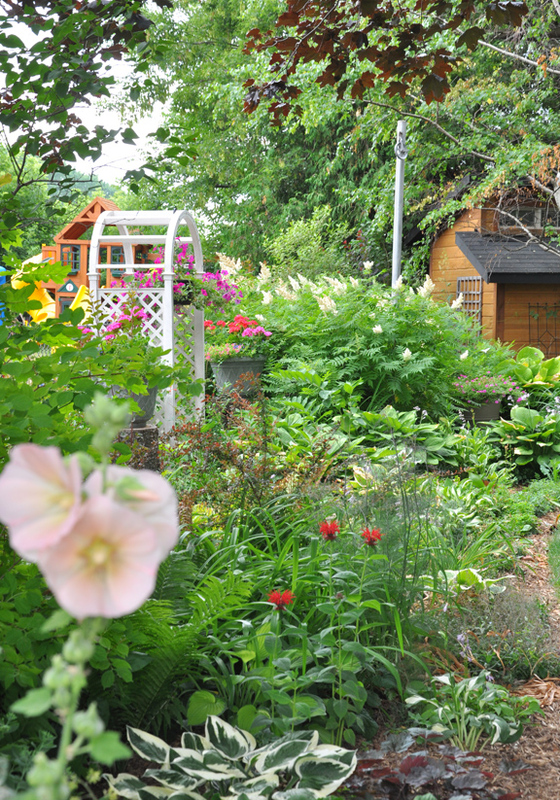 Begin preparing the planting area by adding some compost or aged animal manure to improve your soil. 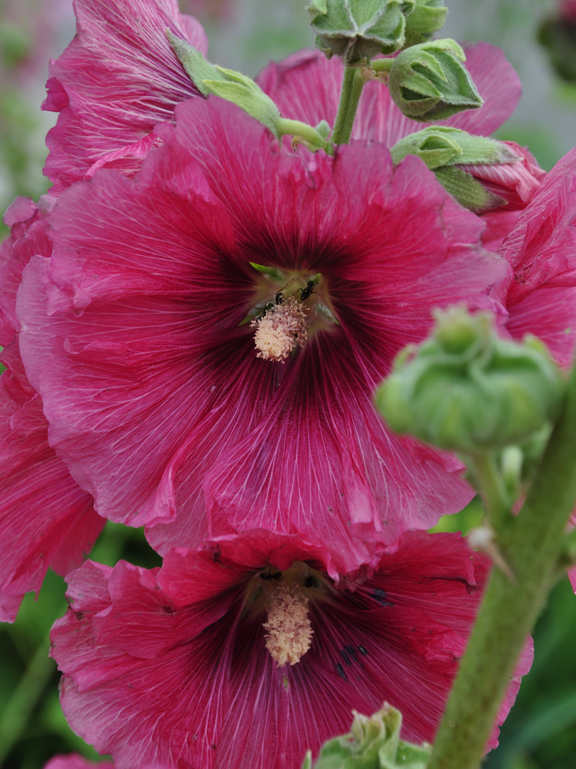 Hollyhocks have large round seeds that should be planted just below the surface of the soil (about 1/4 inch). This best mimics their habit of self-seeding. Keep the soil moist to encourage germination, which usually occurs in 1-2 weeks. Continue to provide water until the young plants are well established. 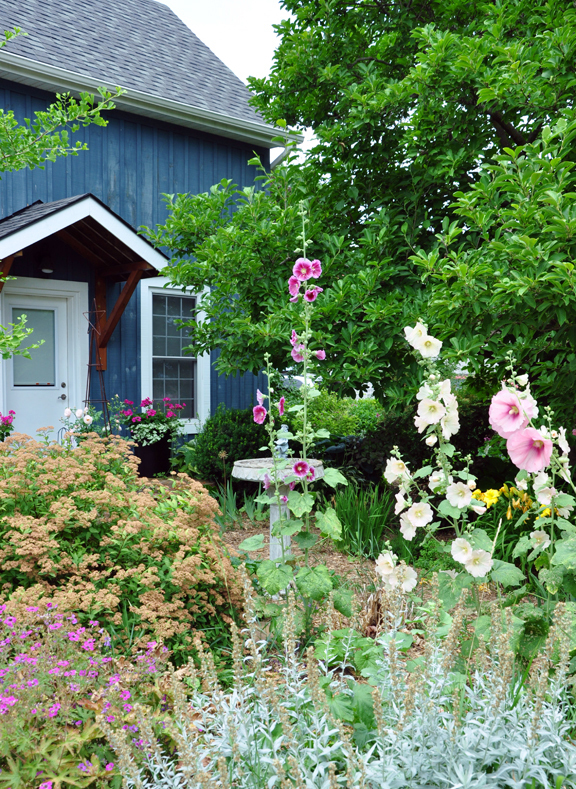 The bad news is that hollyhocks can fall prey to a number of insect pests including Japanese Beetles, sawflies, weevils and spider mites. Knock pests, like Japanese Beetles, into a bucket of soapy water. 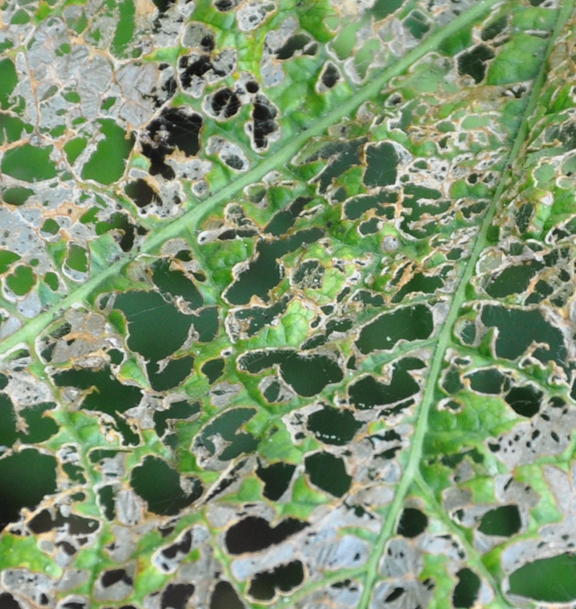 Irregularly shaped holes can be a sign of caterpillars and sawflies. These insects are most active after dark, so look for them at dusk on the undersides of the leaves and along the plant's stems. Remove any insects you find. 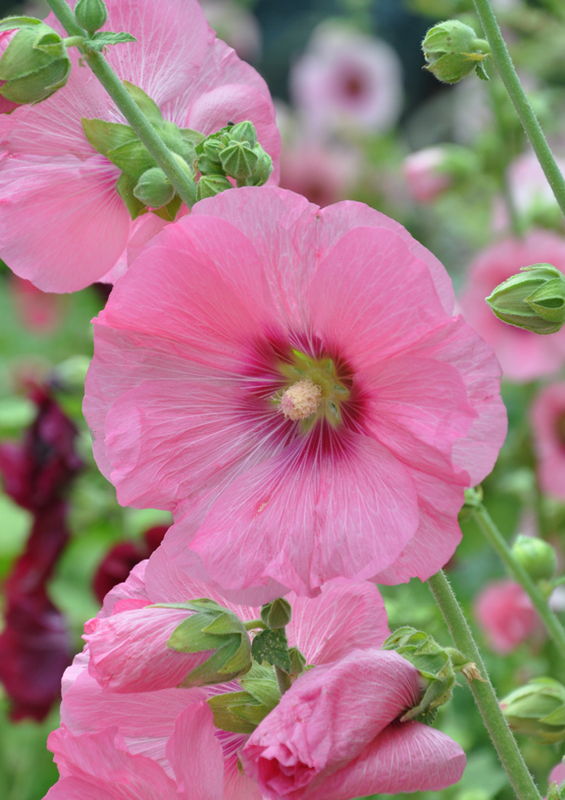 Hollyhocks are also susceptible to rust and powdery mildew. Usually, fungal problems first appear on lower leaves and spread upward. 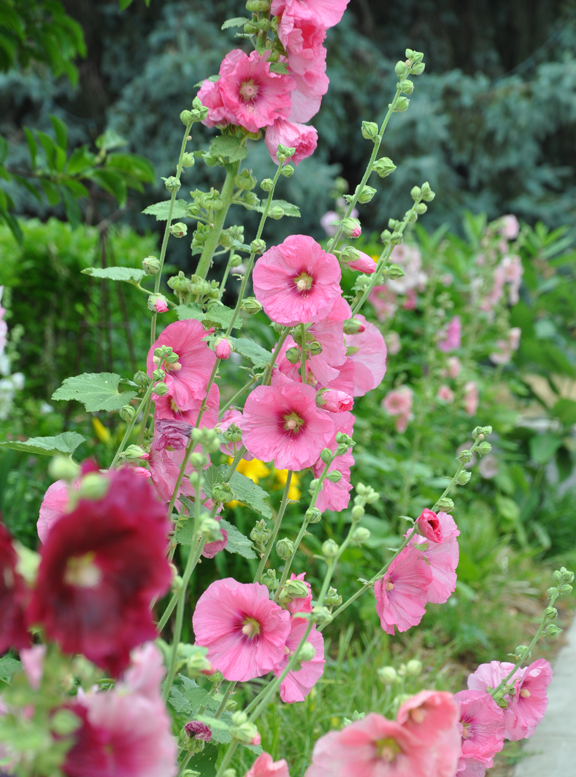 To avoid issues with rust, plant hollyhocks in an open spot that offers good air circulation. 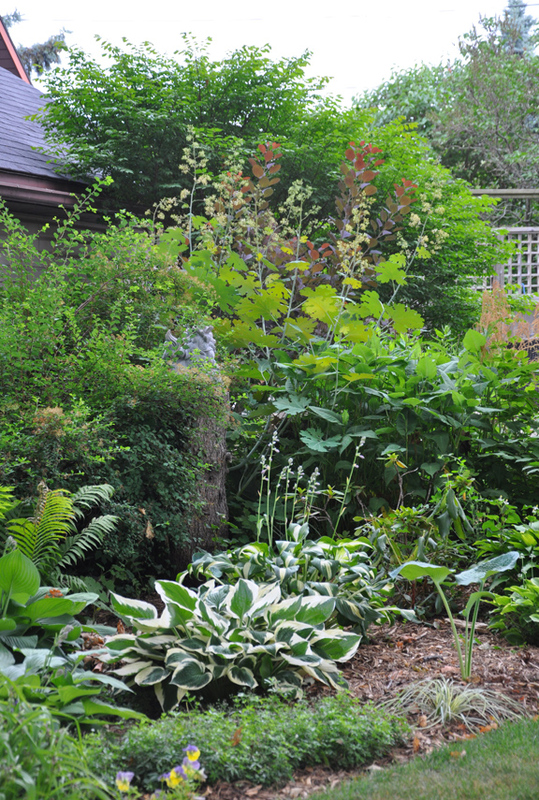 It is also a good idea to avoid splashing the leaves, so water them at ground level. of Lamium (a good groundcover perennial). I wanted to include this photo because this a real-life example of what it means to garden–messy but necessary hoses dragged out to get water to thirsty plants. This is the porch area at the side of the house. Colorful annuals in containers on the porch. A flagstone pathway leads to the back gate. Unlike the front of the house, the backyard is quite shaded. Hollyhocks still manage to put in an appearance, but there is a broader mix of perennials and shrubs that can handle part-shade to full shade. Isn't this combination of peach, soft yellow and grey-green pretty? The large leaves with glaucus stems and pale yellow seeds are Plume Poppies. 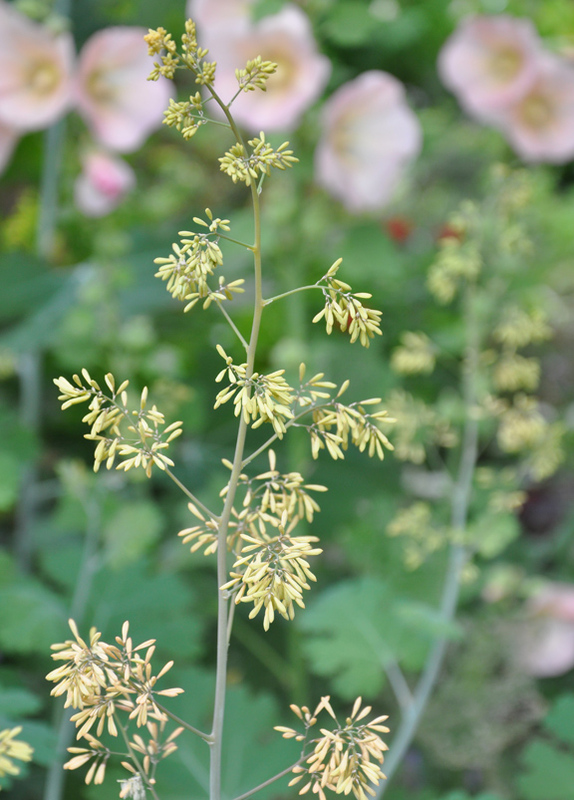 Plume Poppy, Macleaya cordata is a somewhat controversial perennial. It's a tall, statuesque plant that has gorgeous foliage and panicles of tiny white blooms that are the plant's namesake "plumes." In the fall, the leaves take on the most amazing shades of yellow and orange. 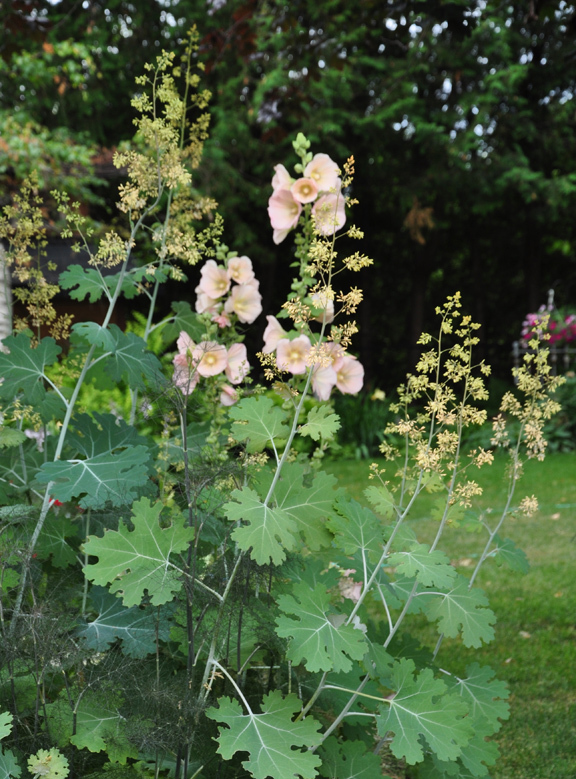 The downside is that Plume Poppy is an aggressive plant that spreads by rhizomes and by seed. A look at the flowerbed that runs the length of the property. Hosta are one of the key perennials where the backyard is very shady. 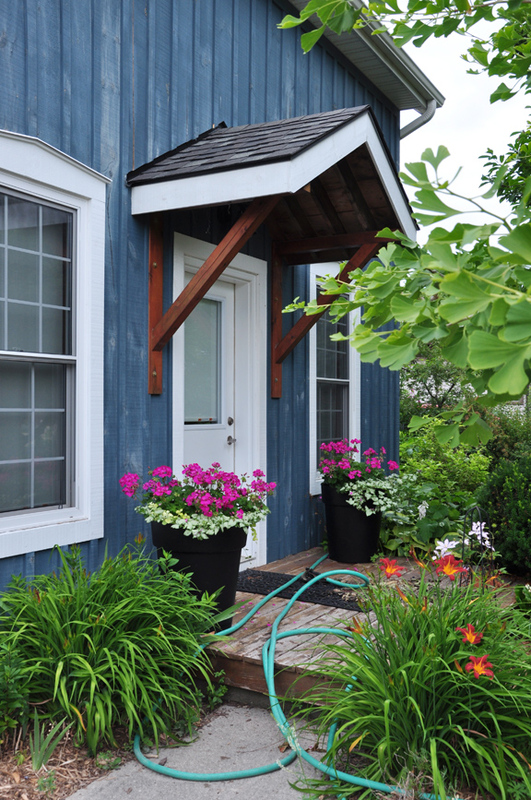 More Plume Poppies, hosta, ferns, a Spirea and a Smoke Bush fill out the corner by the garage. Peeking through the plantings you can see an Asian "foo dog" on a tall pedestal (seen in detail in the next photo). 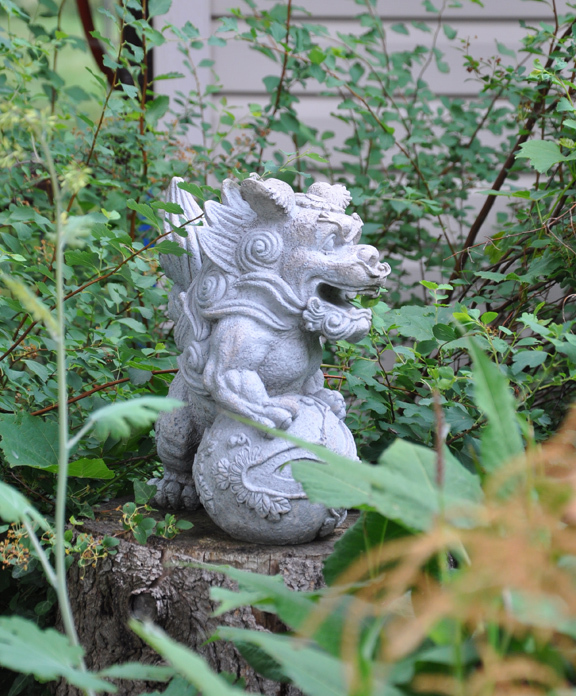 Foo dogs are guardian lions that are placed outside a home to protect it from negative energy. Their frightening appearance is meant to deter anyone with malicious intentions from entering your home. 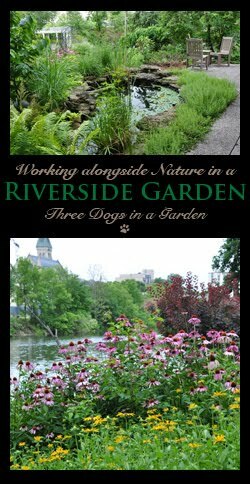 I hope this tour has given you a little inspiration for your garden this spring. While we have a beautiful Spring day today, yesterday was miserable! Always enjoy the lovely gardens that you visit and photograph. Your posts make me feel like I have been walking through someone's garden. Thank you! That's so kind of you to say Melissa. I love Hollyhocks. Beautiful tour! 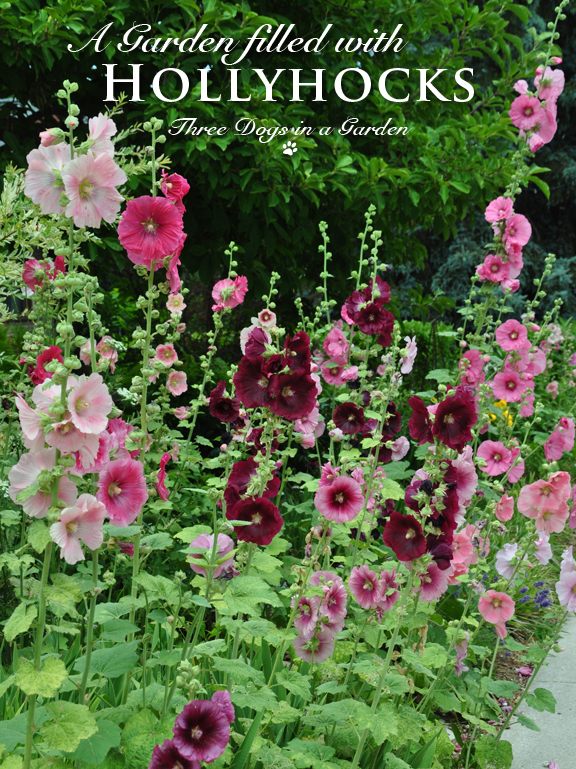 Those peach hollyhocks are exquisite! Thanks for the tour. 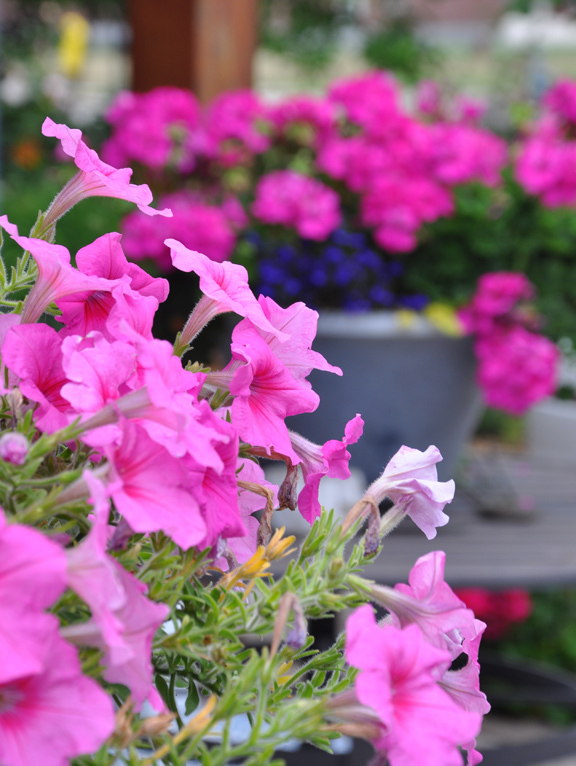 I am not a big fan of the color peach, but I really liked those hollyhocks in particular. They were such a nice soft color, I'd love to grow some myself. Those soft peach roses are gorgeous! Do you have any guesses as to what variety they might be? I have a very similar rose in my own garden. 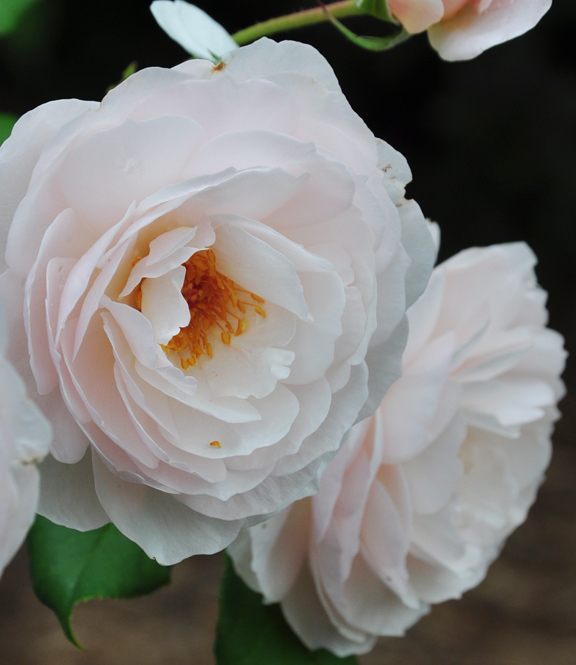 It is a David Austin rose called 'Heritage'. 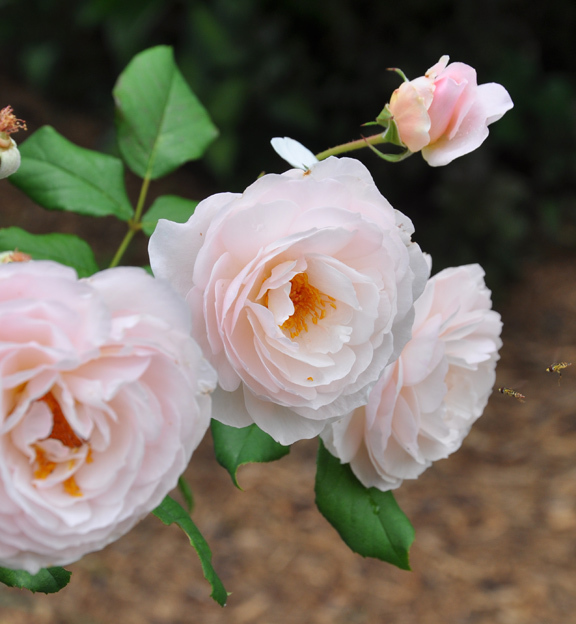 If you like the old fashioned beauty of the rose in the post Kristin, I'd suggest you look through a listing of David Austin roses. There are a few that have a similar look and color. I love to hear from you. Thanks for leaving a comment. 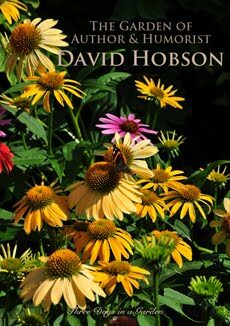 A List of 2019 Plant & Seed Catalogues! © Jennifer Connell 2010. Simple theme. Powered by Blogger.